BusyGamer.com [The Official Busy Gamer Website] » Blog Archive » Dungeons & Dragons Online to be a free for all. Dungeons & Dragons Online to be a free for all. The microtransactions are making us free! Die! (Gamestop) – The Dungeons and Dragons Online upgrade, slated for this summer, will allow players to download and play the game free of charge, with revenue coming from microtransactions. Current subscribers will automatically be enrolled in its VIP program, which includes exclusive access to additional races, adventure packs, locales, and the upcoming Monk class. Moreover, current subscribers will get a “priority access” in the closed Beta of the new DDO Unlimited upgrade, which began today. Players who choose the free-to-play plan are encouraged to buy additional content, such as potions, equipment, and adventure packs via the new DDO Store which coincides with the release of the Eberron Unlimited upgrade. VIP customers will accrue Turbine Points each month which can be used at the store to purchase virtual goods. 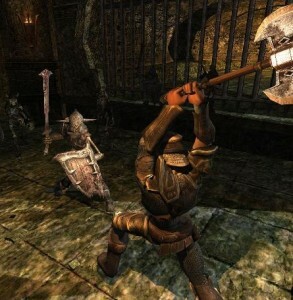 DDO Unlimited will offer over 100 updates, skills, quests, feats, and enhancements. It will also raise the level cap to 20, introduce the Monk class, and add more than a dozen new dungeons. This entry was posted on Wednesday, June 10th, 2009 at 12:00 pm	and is filed under Gamer News. You can follow any responses to this entry through the RSS 2.0 feed. Both comments and pings are currently closed.